The Modern, Metal-Free Way to Straighten Your Teeth Without Braces! 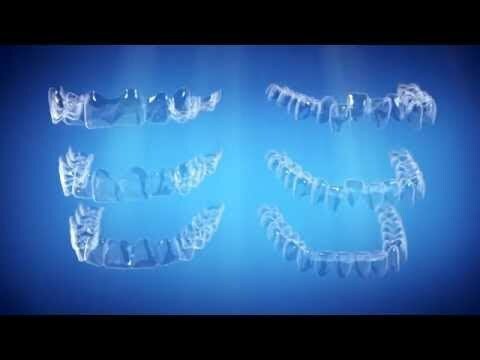 Invisalign is the clear alternative to braces! Invisalign ® is a type of orthodontic treatment that has recently become available. The most exciting feature of Invisalign ® is that teeth can be straightened without traditional braces. In fact it can correct many issues associated with the alignment of the teeth simply by using clear retainers that exert a gentle pressure over time, usually 6 to 12 months. Patients who present with concerns of crowded teeth, too much space between teeth, missing teeth, extra teeth, as well as various jaw issues can be helped by this method. One of the most exciting advances for patients with misaligned teeth is Invisalign ® which is the brand name for a kind of braces that are removable and practically invisible. It is actually a series of clear aligners that you wear like an athlete wears a mouthpiece. As the treatment progresses, your teeth gradually move to a new position and then you start wearing the next aligner. Dr. Chris Stevens will design the treatment program so that by the time you are finished wearing the last aligner in the series your teeth will have adjusted to the desired position. Once your permanent teeth are in, usually between the ages of twelve and fourteen, you are a candidate for Invisalign®. While teens love how invisible their orthodontic treatment can be, Invisalign® is especially popular with adults. Now it is not too late for people to address crooked or misaligned teeth later in life. Before Invisalign®, some adults thought they were “too old” to have metal braces on their mouth. Ask Dr. Chris Stevens whether your smile can be enhanced with the Invisalign® technology. What are the Advantages of Invisalign®?